The Smuggler's cove retrofit is all about "making up the difference." Which is really where a vast majority of our energy is consumed. Heaters and coolers work best when working within a certain parameter, so getting the baseline home temperature is key to saving every. This house does exactly that! Sealing air gaps, adding insulation and conditioning the roofs and crawls goes a long way to keeping that difference as low as possible...which means you end up using much less energy! Hot water heaters are always running, keeping the water they store at an exact temperature. The more water you use, the more the hot water heater has to work. Even if you use no water at all, the temperature is likely to drop over time and the heater will have to turn on to make up the difference. Why not just turn it completely off when not in use? Conditioning a crawl space is one of the best ways to really secure your building envelope as well as serves a great place to put mechanical equipment. 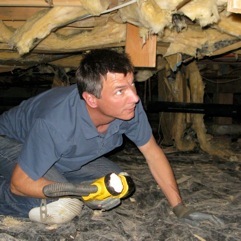 Keeping the crawl space conditioned will really help "make up the difference" between the temperature outside, vs. a comfortable temperature inside. The Smugglers cove retrofit makes use of a dual zone ductless heat pump system. With this system, the 2nd head unit remains off when not in use while the main head unit continues to heat and cool the major use areas of the home.